Got the January blues? Ready for some hot weather? Or are you THRIVING in the throws of winter? Half summer activities, half winter activities, CEB's "Snowflakes and Sundaze" Vol Night Long has something everyone can enjoy! Come dressed for your favorite season and enjoy simulated surfing, ride a mechanical shark, skate on an iceless ice rink, play a round of putt-putt golf, and check out our awesome photo booth! If that wasn't enough, this clash of the seasons comes with FREE FOOD! We hope to see you there in the NEW ballroom in phase II of the student union. It was cool in concept, and I liked the ballroom, but there were some major flaws. 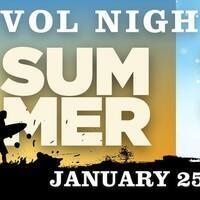 I usually love the vol night long events. This one was probably the most disappointing out of all of the ones I've been to. They said food would be there, but the food was just Chick-fil-A nuggets. You got 5 nuggets and 27 minutes in they were out of them. They may have gotten more eventually but there was no reason for me to stay to find out. Then the 'attractions' the only attractions that were not half-baked were the shark ride and the mini golf. The iceless ice skating was awful. The reason ice skating works is because of the thermodynamics of how when ice is compressed it becomes liquid. You cannot glide on plastic. Then the surfing was awful. The guy running the 'ride' straight up told me before I rode "don't go on it's not very fun," and he was right. It was a small platform that slightly tilted and nothing else. Unfortunately the shark-like bull rides looked fun but the line was 30 minutes long to ride and each person was knocked off in about 3 seconds. Lastly the mini golf looked fine but I have mini golf and there was also a line for that. All in all I want to love this event. Examples of great vol night longs of the past exist. I loved the foam party, the treat yourself one, the silent dance party and the roller skating. So please whoever runs this, it has the potential to be great!